Airocle’s F Series of operable wall louvres combine optimum natural airflow with full natural light control via an innovative technology inspired by natural forces and backed by sound science and rigorous testing. The F Series louvres achieve an 83% free open area when fully opened offering maximum airflow in the building. Airflow can be easily adjusted to reach the building’s ventilation needs offering a natural, economical an environmentally-beneficial ventilation solution. A wide range of blade cladding options gives flexibility when it comes to all desired variables of natural light control. Like all our products, The F Series louvres are energy-efficient, reliable and economical. The F Series operable wall louvres are suitable for just about any building type where optimal airflow, natural light and aesthetic are desired. They have a proven track record for commercial, industrial, and community use. Like all Airocle’s natural ventilation products, the F Series operable louvres are built with ‘green’ design principles in mind, contributing to a sustainable future and greener buildings. F Series louvres are a natural ventilation option backed by sound science and powered by naturally-occurring forces. Our products are rigorously tested to ensure high-performance natural ventilation across a wide range of applications. Airocle’s F Series louvres ensure optimal natural air flow into a building. This is both effective and efficient when it comes to lowering future energy usage. The use of a natural ventilation scheme provides numerous benefits resulting in better economics for any business or facility, including lower overall energy costs. Like all Airocle’s products, the F Series of operable wall louvres are specifically engineered and manufactured to a superior standard so as to function optimally for many years while withstanding the toughest of weather conditions. 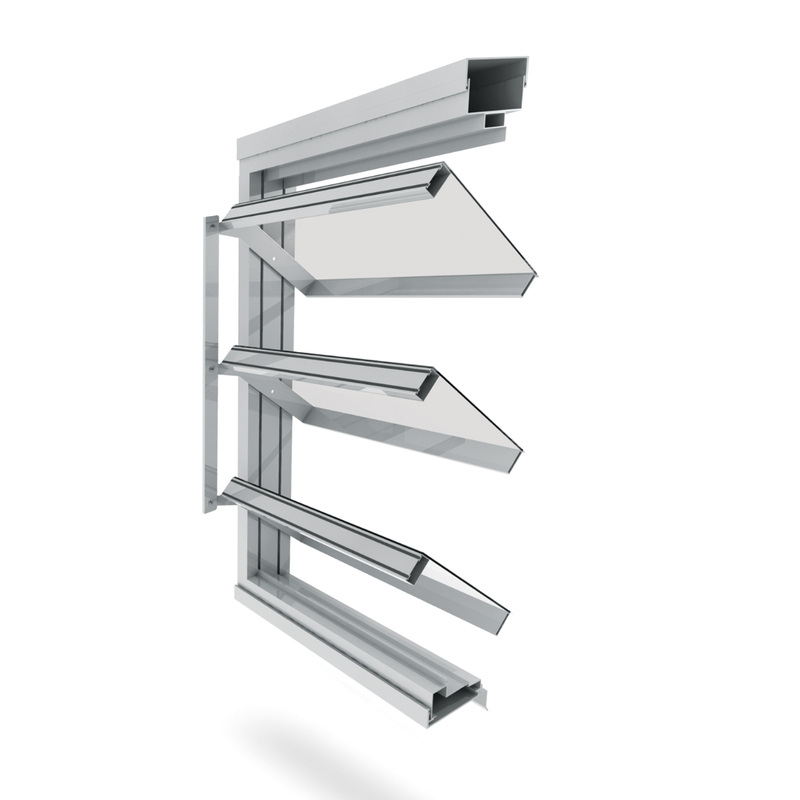 All models feature ‘Weatherstrip’ seals on mullions, whilst the blade pitch is variable (typically 300mm – 400mm). Blade cladding is available in five options: polycarbonate (clear or opaque), glass (clear or opaque), fibre glass, pressed sheet-metal, or profiled sheeting to match the surrounding wall cladding. Optional features such a bird/insect mesh, rain sensors, volume dampers and dust filters can be added depending on the project requirements. They are shipped with all hardware and can be easily installed by qualified tradesmen. The F Series louvres can be installed using standard extruded sub-sills and head channels for a commercial finish. The F Series louvres employ efficient, aesthetically-pleasing design coupled with natural science. Best of all, once installed they operate with virtually no running or maintenance costs. This provides long-term operational savings for both the building and the environment.